Many of us attend conferences. Whether you regularly attend those designed to bring together social media types, events that teach, or networking meet-ups, getting the opportunity to speak can help you build your brand and get exposure to hundreds or thousands within your niche. Even if you are a bit shy, it's possible to have your voice and ideas be heard as a panel moderator. 1. Introduce yourself, but keep it brief. It helps your audience to understand your qualifications for moderating -- but by all means, don't take away precious time from the panel. 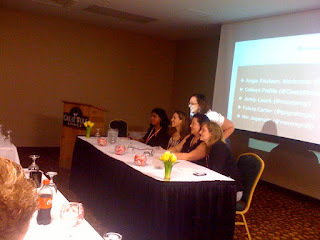 A few sentences about you, your blog, and why you feel passionately about the panel topic is sufficient. 2. Build up your panel to be great! One of the best moderators I have had the pleasure to witness is Susan Wagner. Her style really stuck in my mind, because she took time before the panel questions to thoroughly introduce each panelist in a way that made them seem competent and valuable. 3. Be prepared to zig. Then zag. You may have all of your panel questions prepared ahead of time. I usually have between 8-10 questions ready to go that I know at least half the panelists can speak about. I also know that there is no way to know what kind of audience you'll have until the day of the panel. You may find that they are growing restless during a topic (either due to it being something they've heard too much of before, or it is outside of their expertise). This is a great time to abandon that group of questions and move on to something more relevant. Other unknown factors include a panelist not showing up or panelists that don't "play well" off of your questions. Go with your gut to change things up and keep the conversation moving. 4. Beware of "chattiness". There is one in every audience (and usually more than one, to be honest.) An attendee that starts with a question and then continues to either keep asking questions, or offer personal commentary on every new point that is raised. These attendees don't usually intend to make the panel conversation all about them, but they can get on the nerves of everyone else in the audience and make the conversation too narrow for anyone else to benefit from. 5. Give nonverbal clues. If you've ever witnessed an auction, there is much communication going on during a bid -- and most of it is done without talking. When moderating a panel or an audience Q & A, it's best to keep the conversation flowing with nonverbal, directional gestures. For example, you may see someone straining to get their hand up in the back of the room, while the panelist is still answering the last question asked. You can point to the person and nod, signaling that they will be next to speak, but without interrupting the person talking at the time. You may also walk around to the part of the room where there is much chatter going on to "quiet them" (remember this from school days?) You don't have to appear superior or controlling, just make your rounds. It helps to let everyone know that the entire room is affecting the success of the panel. Above all, it's important to speak clearly and naturally and have fun! No one wants to watch a moderator with no energy, and how you address the room really spreads. If you can enjoy yourself, so will your panelists, and the entire sessions will be that much more exciting to watch. If you know people in the crowd, don't be afraid to address them by name, use them in your examples, and thank them for their questions. It's a community thing, after all! Have you moderated a panel or event? What tips would you like to share?